The first smash-hit, sold-out-everywhere game of 2014 is expanding! 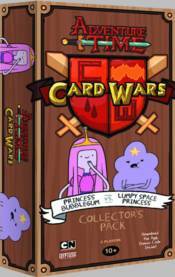 This time, Princess Bubblegum and her NiceLands deck take on Lumpy Space Princess's totally rad dual-Landscape deck in a royal rumble! First teased in the original two Collector's Pack sets, and then previewed in the For the Glory! Booster packs, NiceLands are finally playable! This new Landscape type is as fluffy as a little bunny nibbling on some grass. But if you give it an owwie on its widdle foot� boy howdy, do these guys get vicious! Pack includes two 40-Card Decks, 8 Oversized Lane Tiles, and lots and lots of Hit Point Tokens!